Physical training for golf is a hot topic. All the top players are doing it and highlighting it’s importance, whilst some people think its ruining careers. Much of the criticism around physical training for golf tends to either warn about the dangers of becoming too bulky, or that the player will injure themselves. Like most things, the devil is in the detail. Of course any type of physical training has some inherent risk. If the training is appropriately managed, organised, and executed there is only positives however. Hitting the ball further is the main reason people workout out for golf, especially better players. Many forget about other benefits that are definitely worth consideration. 1) Increased ability to tolerate large volumes of practice, play, & daily commitments: This is especially relevant if you are a more serious player, but holds true for everyone who practices and plays a lot. Trying to withstand the demands of practice, competitive play, work/school, and possibly travel is asking a lot from your body. I’m a firm believer that being in good general shape and taking care of your nutrition will go a large way towards being able to withstand these demands over a long period of time. We all know the person who finishes 18 holes and is a wreck. The idea of any additional practice, possibly some physical training, study/work, etc is a wild dream. In reality this is what most good players are doing on a daily basis, for an entire season, years or decades in a row. If you listen to collegiate or even more so tour players talk about their daily practice and training regimens you can see a lot of time and effort goes into the level they play at. It’s not simply a couple of hours practice and showing up to tournaments. It’s essentially a full time commitment. Any serious golfer would be foolish to think that taking care of their physical condition and nutrition isn’t worthwhile. You will have more energy during your practice & play, and recover faster in between sessions. 2) Reduced chance of injury: Nobody worries about injury prevention until they get injured. The quickest way to halt your progress in a sport is to miss practice and competition time due to injury. A common complaint I hear from some of the players I work with is that they have started to practice more, and because of this they are starting to get sore backs, shoulders, elbows etc. Having a training plan in place that improves the strength and endurance of the structures being stressed during your play and practice is essential for reducing the likelihood of an overuse injury. Golf is a sport in which the movements being carried out are extremely repetitive. As a result very similar stress is being placed on the same tissues and structures, in large volumes (especially in long arduous range sessions). In addition to physical training, increased variability of movement is desirable for reducing the potential of injury as it allow tissues and structures to distribute stress over a larger surface area. A way this can be applied to golf practice is by taking mini breaks during sessions to do some restoration exercises, or by more regularly switching the types of shots you are practicing. Swapping between full swings, pitch shots, & putts for example will provide variety that may be easier on the body than 100 6 irons in a row. 3) Makes swing improvements more attainable: Even if you have the best swing coach in the world they can only work with the physical qualities you possess at that time. The golf coach Adam Young touches on this in his very popular book “The Practice Manual“, which I highly recommend. Good coaches whether golf or fitness, realise that not everyone can carry out movements exactly as you would like them too, and modifications may be necessary. Everybody loves talking about certain moves in DJ’s or Rory’s swing, but often don’t realise these moves are impossible without exceptional mobility, stability, strength, & power. 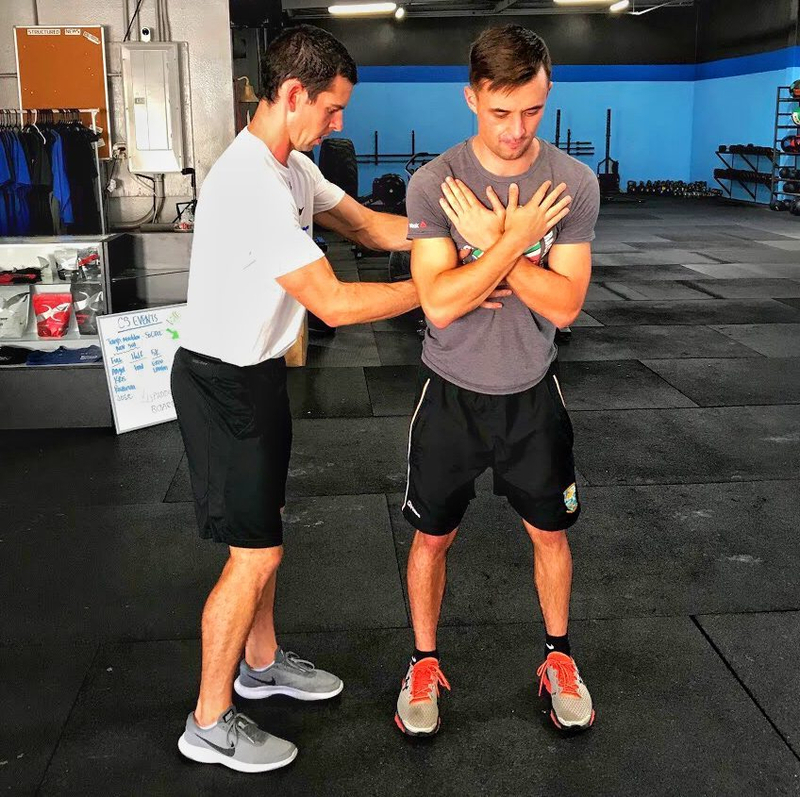 If you can start to work on your body with a strategically designed program specifically for golfers your ability to make more efficient powerful swings will drastically improve. After a few weeks of going through my training programs players regularly comment that they are hitting the ball longer and more solidly because they feel like they have improved their posture, increased their stability, and find they have more mobility to make a turn. This is especially true for good players who have never trained before as they already have the skill and just needed some horse power, and higher handicap players who learn what good posture, stability, and a dynamic rotation feel like. While the better players that seek my services are often solely interested in performance improvement, more recreational players are often looking for something that will help their golf, but also improve their general quality of life. At the moment my work is split between players whose main focus is performance, and others who like golf but want to stay as fit as possible, and keep playing golf for as long as possible. I try hard to provide my customers and clients with information that will help improve their golf games, but it’s also extremely satisfying to feel the programs I provide are having a positive effect on their everyday lives. If you feel it’s time for you to get “Fit For Golf” check out the Fit For Golf 12 Week Online Training Programs. For a limited time you can avail of 50% off by entering FFG50 in the coupon bar at checkout. This is part of the 5000 Follower Twitter Sale. Big fan of your content. I really like the last part about training for better health/life overall. While I base the excercises I do on ones that will help increase golf related performance. I find that they help for other sports I play and how good I feel overall. I’m able to concentrate on important aspects like flexibility, speed and stability and balance instead of just doing the same basic workouts over and over again (back day, chest day, arms day, etc.). By doing golf related exercises I feel way better after my workouts and feel I worked out my entire body every time. Plus it motivates me to get into the gym more knowing that it’s not only helping me maintain good health but also helpIing my golf game. I find it a lot easier to stay committed to. Thanks for the comment and kind words Ryan. I am glad you like the content. Good to hear you are enjoying the benefits of making your training specific to golf as opposed to general fitness. What program are you working off?